As part of the International Cool Climate Chardonnay Celebration held in Niagara-on-the-Lake were lunches. I was lucky to be able to attend the Peller Estates i4C Taste of Terroir. A multi-course lunch with Chardonnay from around the world. 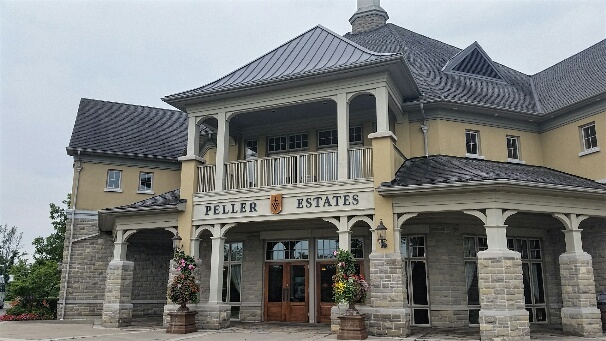 This is the first time I visited Peller Estates, and I must say that their tasting room and restaurant is quite spectacular. The vineyards wrap around the Estate. In the basement you will find a barrel room, and a special 10 Below ice wine lounge tasting room. We had a chance to go into this unique lounge, after we put on our winter parkas. Before starting our lunch, all attendees were guided around the Estate to show us the vineyard, as well as the Estate. In the vineyard, we tasted a Hahn Estate Santa Lucia Highlands 2015 Pinot Noir from California, and a 2013 Pinot Noir from Chamisal Vineyards from the Niagara region. Further spoiling of us, we also tried the Marcel Cabelier Cremant du Jura 2012 Brut and a Peller Estates Ice Cuvee (a sparkling wine that uses ice wine as the dosage to sweeten the wine). Chef made very nice pairings between their locally sourced ingredients and the wines presented to him. The House Made Ricotta was sour, creamy, salty and grainy. The Chamisal Chardonnay was a complementary pairing. The wine had a ripe honeyed stone fruit nose. Fuller bodied, round, with balanced acidity. Stone fruit flavour with peppery finish. The Digby Bay Diver Scallop had a nice light sweetness to it. The sauce had some pepperiness, while the peas and pea pods provided separate crunch. It is a rich dish. The Hahn SLH Chardonnay was also equally a rich wine, making the pairing work well together. The wine has a medium toasty nose. Off-dry, medium plus body, very honeyed flavour, along with citrus, and pepper, with oak in the background. 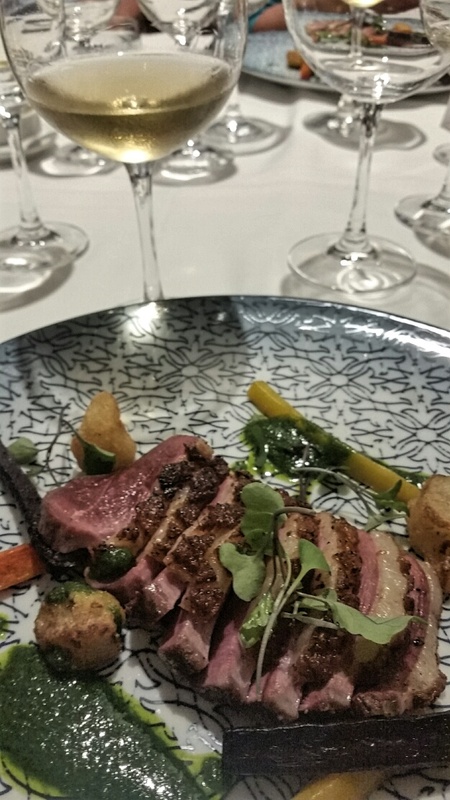 The Seared Duck Breast had a nice grilled flavour with a salty, fatty crust. 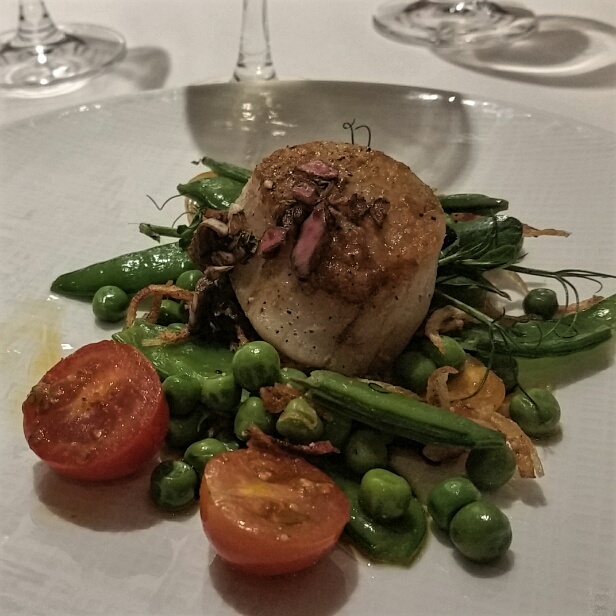 The oak and pear flavours from the Marcel Cabelier Cotes du Jura Chardonnay Vielles Vignes wrap around the texture and flavour of the duck breast. The mint sauce is a nice understated component to this dish. The wine is deep golden coloured. Deep apple and pear nose. Dry, medium body and acidity, with pears, oak, and vanilla flavour. Light mouth feel. Our last dish, dessert, was the Apple Washed Rind Saint Honore Cheese from Quebec. This cheese was apple infused by chef by adding apple juice to the cheese and vacuum sealing it. The Late Harvest Vidal wine jelly offered some additional sweetness to the apple sweetness for this creamy cheese. The chive added a herbal component that stood out in the dish. The Peller Estates Private Reserve Chardonnay had the same level of body and intensity to make a complementary pairing to the cheese. The wine had a light honey and stone fruit nose. Medium body and acidity. Pears on the palate with pepper on the finish. Thank you to Peller Estates for hosting this lunch, for the i4C Celebration for inviting me to attend, and the wineries for providing the wines for this lunch. If you have a chance please visit Peller Estate at Niagara-on-the-Lake. 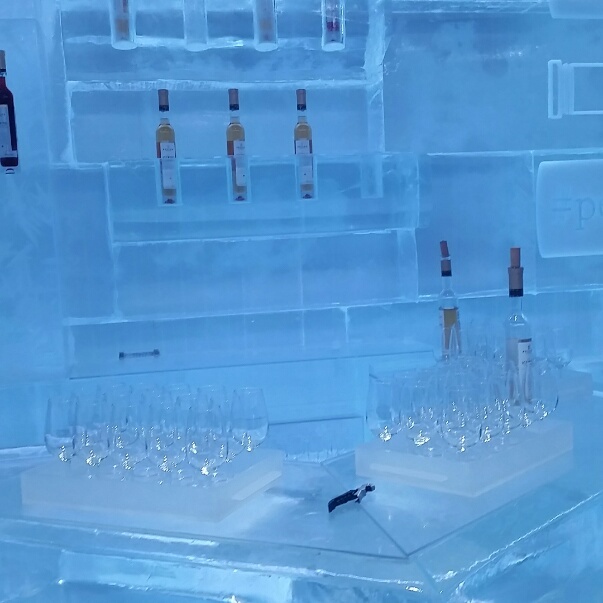 Visit their 10 Below ice wine tasting lounge and enjoy lunch or dinner.